The theory which has been guiding monetary and financial policy during the last thirty years, and which I contend is largely the product of such a mistaken conception of the proper scientific procedure, consists in the assertion that there exists a simple positive correlation between total employment and the size of the aggregate demand for goods and services; it leads to the belief that we can permanently assure full employment by maintaining total money expenditure at an appropriate level. Well, there actually is a clear positive correlation. That’s odd. Nevertheless, I find the idea of pretense of knowledge fascinating. As a scientist, I often come about ideas which I find rather strange. One of them is the LIBOR. The London InterBank Offered Rate is determined by asking some banks at which rates they lend to other banks. It is actually a survey. Many loans nowadays are based on the LIBOR plus some risk premium. If you want to get a loan to finance a ship, let’s say, your bank lends you $100 million at LIBOR+3%. That ensures that shifts in the interest rate will not be to the benefit of either lender or borrower. Otherwise, the borrower would win if the actual interest rate moves up and the lender when it moves down. There were two implicit assumptions in Libor. One was that banks were virtually risk-free, or at least that their risk was small and would not vary much over time. The other was that there was a way to actually calculate what the rate was. Both assumptions turned out to be wrong. Now after the LIBOR scandal it should be clear that both assumptions are wrong. Banks are not virtually risk-free and they would only be so if the lender of last resort – the Bank of England – would always bail out the banks without assigning losses to the owners. As we got to know in the last months, the banks also cheated when they answered the survey. Hence the whole concept of the LIBOR is build on shaky assumptions. And this is what Gary Gensler, chairman of the United States Commodity Futures Trading Commission, told the European Parliament this week, too. The LIBOR is only a small part of a financial system architecture that I believe has been built on so many ideas that work only through pretense of knowledge that the whole system is by now utterly unstable. Rating agencies belong to that system, and mathematical models run by so-called quants, high-frequency trading, central banks that are run on the assumption that if only we can achieve low inflation all the rest will be fine, etc., etc. With all these institutions named above the world has seen the biggest financial crisis since the Great Depression, and it is not like nobody saw it coming and it is not like we had a whole lot of financial crisis in the last 30 years that almost announced what would happen. If you believed in the years before the crisis that “it” couldn’t happen to developed countries, you must have been ignorant. Financial crises hit Scandinavia (of all places!) in the early 1990s after they liberalized their financial system and also Japan, which is still struggling with low (but positive) growth following the collapses in real estate and stock prices. What we can learn in economics should be based on empirical observation and logic, which is mostly presented in the form of models. 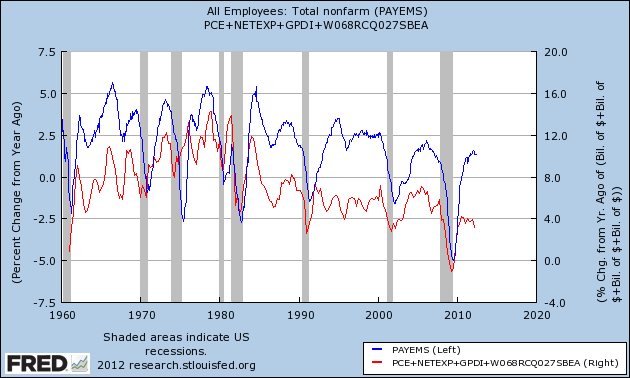 One empirical fact that seems to have stood the test of time is that from above, the relationship between employment and aggregate demand. When the private sector is not spending and hence both consumption and investment are low, then government spending is logically the last man standing. Of course, deficit spending might create inflation, however, we also know that inflation is not really a concern right now. Here is the difference of the 10-Year Treasury Constant Maturity Rate (DGS10) and the 10-Year Treasury Inflation-Indexed Security, Constant Maturity (DFII10). 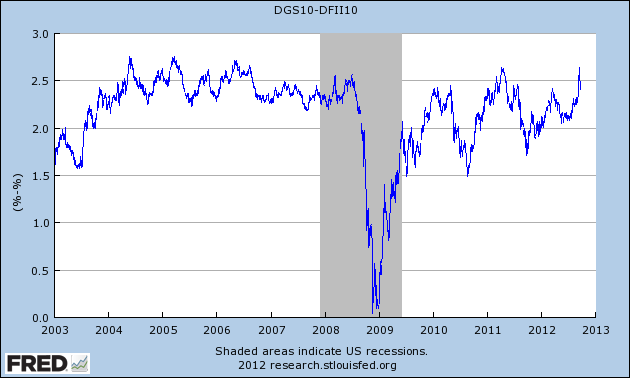 Even though QE 3 has just been announced, that picture does not scream hyperinflation, does it? Notice that the last tiny bit trends downwards. The expected inflation rate is 2.5% and falling. Of course, I cannot predict the future, but this picture is where we are today.